iwis antriebssysteme offers new corrosion-free CF stainless steel chains. They are exceptionally reliable and durable, and are ideal for use in the food industry and other applications requiring a high level of corrosion resistance. In standardised salt spray tests the new CF stainless steel chains demonstrated outstanding corrosion resistance and excellent fatigue strength. 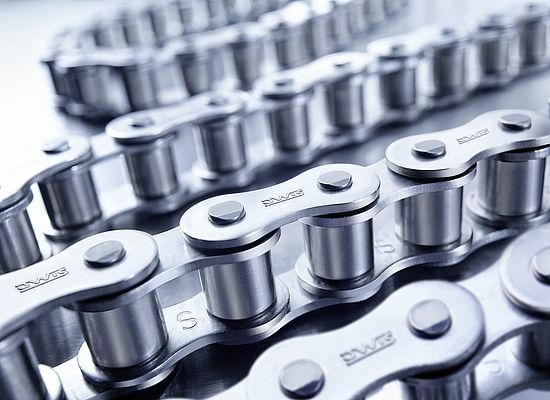 With these characteristics the chains offer outstanding results in demanding environments, with water or steam, stringent cleaning regimes or extreme temperatures. They are typically used in the food industry, in filling and conveying applications and in packaging machinery. The plates of the CF stainless steel chains have better precision blanking than conventional corrosion-free roller chains, increasing service life and reducing elongation through higher press-out forces. All rollers are seamless and therefore exceptionally impact-resistant at higher speeds, which ensures smooth, even chain operation. Seamless bushes reduce initial stretch and allow customised length tolerances, resulting in greater positioning accuracy and speed, especially in dynamic cyclic operation. iwis CF stainless steel chains meet the requirements of ISO 606 (DIN 8187). They can be used in a temperature ranges from -80 to +150 °C. Various special-purpose lubricants are available to allow the chains’ use at high temperatures of up to 400 °C as well as low temperatures. In addition, various H1-approved lubricants for use in food processing and specially developed wax lubricant approved for food use is available.